Your favourite Maya is everyone's favourite now! Yes we are talking about Jennifer Winget. The 32-year-old actress won the Best Actress Drama award at the 17th Indian Television Academy Awards. Jennifer not only walked the red carpet of ITA Awards 2017 but also went back home with a beautiful trophy, which she won for Beyhadh. And thanks to her social media updates, we know the excitement she experienced post winning the award. 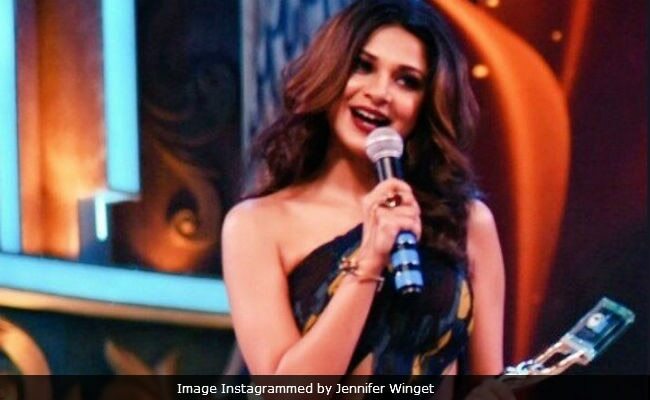 Sharing a stunning picture, in which she's dressed in a thigh high slit gown, Jennifer wrote: "#thatswhatshesaid ...The curtains closed on Beyhadh, but Maya stays with me. This little baby from #ITAwards just made sure! #bestactress." Crowded or Comfortable, Breezer? Still tucking it in... #BestActress #ITA2017 #ITAwards Taking it to bed with me coz #threescompany! Jennifer's happiness just got doubled. The actress now has 4 million followers on her Instagram handle. "Marking 4 million with this baby at the ITA Awards Way to go eh!? Blessed...and It only gets better," Jennifer captioned the picture. Celebrities like Mouni Roy, Arjun Bijlani, Adaa Khan, Kunal Jaisingh, Nakuul Mehta, Shrenu Parikh, Surbhi Chandna , Mansi Srivastava, Kanchi Singh and Rohan Mehra, Avika Gor, Vivian Dsena, Kishwer Merchant, Ravi Dubey, Jennifer Winget among others were present at the ITA Awards. Farah Khan won the Most Popular TV Personality award while Best Actor Popular award was won by Nakuul Mehta & Vivian DSena. Jennifer Winget's show Beyhadh closed curtains recently. Jennifer also featured in TV show Saraswatichandra, for which she won the Indian Television Academy Award for Best Actress Critics. She also starred in shows like Dill Mill Gayye, co-starring her ex-husband Karan Singh Grover and comedy show Comedy Circus 3.